James Robert Love II (Aug. 19, 1831 - Nov. 10, 1885), of the prominent North Carolina Love family, graduated from Emory and Henry College, studied law at Asheville, and was a statesman in both North Carolina and Tennessee. After the Civil War, he would become a member of the North Carolina Constitutional Convention (1868) and serve in the North Carolina State Senate. Like many of his family, Love acquired large land holdings and practiced law. Having moved to Sweetwater, Monroe County, Tennessee during his latter years, Love would be elected to the Tennessee House of Representatives in 1884, an office he would hold until the time of his death. 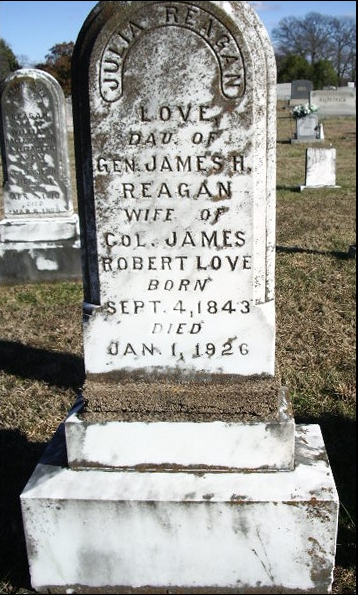 James R. Love, also known as J.R. Love, was first cousin to Sarah Love, the wife of Confederate colonel and Cherokee chief William Holland Thomas. His grandfather was Robert Love, the patriarch of the city of Waynesville, a rural town nestled in the pristine mountains of North Carolina. (Right) James Robert Love while in his early 30s during the Civil War. Postwar, James Love married Julia Reagan, in 1868, and they resided in western North Carolina before moving to her hometown of Sweetwater, Tennessee, the location where Love would continue to increase his landholdings and serve as a distinguished statesman. Julia's father was James Reagan, a 60-something year old serving as a brigadier general in the Tennessee militia, and late in the four year war he was arrested by Federals and imprisoned in Knoxville, the location where he would die just six months before the conflict ended. Suffering from lingering wounds that he received while serving under Lee in the Army of Northern Virginia, Love was serving as a representative in the lower house of the Tennessee General Assembly when he died on Nov. 10, 1885, aged 54. He wife Julia would remain a widow and wait several years, 41 to be exact, before joining James in the hereafter as her body was laid to rest next to her late husband on January 1, 1926. (Right) Love Brothers. A wartime photograph of James R. Love (seated right) and two of his brothers: Dr. John C. Love (seated left) and Dillard L. Love (standing). 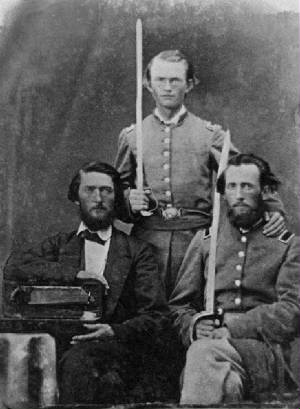 The three brothers posed for this picture while they were all members of the 16th North Carolina. Dr. Love later became Assist. Surgeon of Thomas' Regiment. Dillard Love, at the time of this photo, was Lieut. in Co. A, which was transferred to the 39th North Carolina after brief service with Thomas' Legion. Courtesy Clark's Regiments. There were numerous Confederate veterans, including those of the Love and Reagan families, who have been interred in the West View Cemetery on Monroe Street, in Sweetwater, TN. For most of the Civil War, also called the Confederate War, Lieutenant Colonel James Robert Love was Commanding Colonel of the unit's infantry regiment, causing many to refer to it as Love's Regiment. James Robert Love would initially serve in the Confederate military as a Captain in the 16th North Carolina Infantry and fight in the battles of Seven Pines, Antietam, Seven Days Battles around Richmond, and Second Bull Run. Love was wounded in the engagement of Seven Pines, where he saw the elephant, and even served under the likes of "Stonewall" Jackson and Robert E. Lee. He was later transferred to Thomas' Legion of Indians and Highlanders, the only legion raised in western North Carolina, and would command the regiment, of the legion, for a good portion of its tramp and fight in the Shenandoah Valley Campaign of 1864. With its infantry, cavalry and artillery, the Thomas Legion was similar to the organization and size of any given brigade of the conflict. Early in the war the legion would occasionally place in the field some 2,500 men, including a fraction of the 400 Cherokee Indians that would eventually fill its ranks. The soldiers of the unit hailed mainly from the mountains of North Carolina, with a portion from just over the other side of the rugged terrain in nearby East Tennessee. In respect to the highest rank obtained by James Robert Love during his Civil War service, some assign Lieutenant Colonel and the other Colonel, commonly know as full-bird, but both can't be correct. The answer may be found in the official documents themselves, however. Almost one month after Lee surrendered to Grant, we find in the Official Records of the Union and Confederate Armies, 1, 49, part II, p. 669, that on May 7, 1865, one Union Colonel C.G. 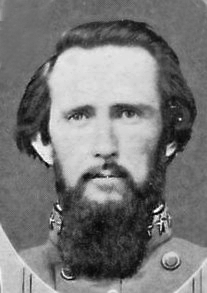 Hawley, Commanding IV Brigade, IV Division, Department of the Cumberland, reported to headquarters that, "I have the honor to report that General Martin, Colonel Thomas, Lieutenant-Colonel Love surrendered to Lieutenant-Colonel Bartlett their forces with Department of West North Carolina." In his "Memoirs of the Civil War," Lt. Col. W.W. Stringfield, pp. 40-41, wrote that in 1913 he had "secured from Mr. John S. Rice, who was present, the following statement regarding the historic incidents of the final surrender. Mr. Rice makes the following written report. I hereby make and subscribe to a statement of facts concerning the movements of troops of the 69th N.C. Regiment under its Colonel Wm. H. Thomas and its Lieutenant Colonel James R. Love." So even a half-century after the late rebellion, Love was stated as being a Lieutenant Colonel. It remains, however, common military custom to address any individual with the rank of Lieutenant Colonel as COLONEL; which was what Rice does during the rest of his statement. In order from junior to senior, the ranks are Major, Lieutenant Colonel, and Colonel. Above Colonel we find the four General ranks. (Left) Julia Reagan Love. Dau. of Gen. James H. Reagan. Wife of Col. James Robert Love. Born Sept. 4, 1843 - Died Jan. 1, 1926. 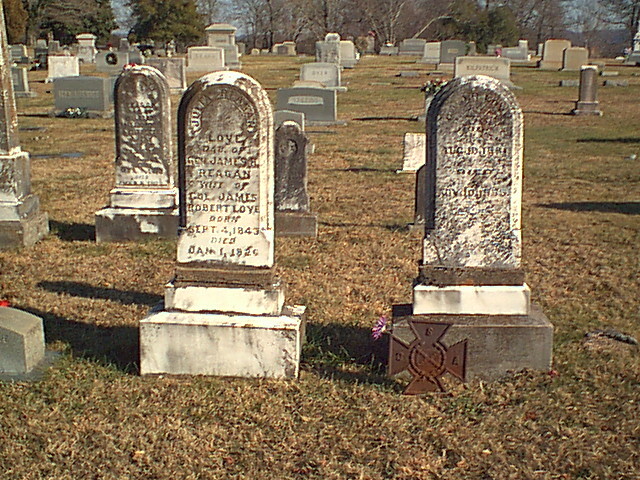 (Right) Col. J. R. Love. 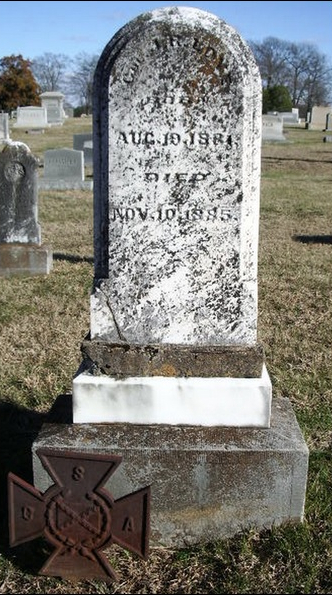 Born Aug. 19, 1831 - Died Nov. 10, 1885. While Brigadier General Martin was also referred to as GENERAL Martin at the surrender, which is an acceptable abbreviation, the rank GENERAL was held only by few, such as Robert E. Lee and Braxton Bragg. Brigadier General also remains the entry level or lowest ranking officer of the four General ranks: Brigadier General, Major General, Lieutenant General, and the most senior rank being known as General. Notwithstanding, in this report, Love was addressed by his formal rank of Lieutenant Colonel. Vernon H. Crow, Storm in the Mountains, however, stated that Love was promoted to Colonel in March 1865, but Crow's sources were the Charlotte Western Democrat and Lt. Col. William Stringfield's diary. And Love was also recommended for promotion to Brigadier General according to Lt. Col. Stringfield's diary entry, dated November 1, 1864. In a conversation with Matthew Brown, Editor, North Carolina Troops, 1861-1865: A Roster, Historical Publications Section, N.C. Office of Archives and History, he stated that the only information indicating that Love was promoted to Colonel was a notice in the March 21, 1865, Charlotte Western Democrat (this was also Crow's source). While Brown said that an exact date of the promotion was not given, he believed that it would have been later than January 17, 1865, which was the last document to show Love as Lieutenant Colonel. Brown did concede that the accuracy of the notice remains unknown. Crow wrote in Storm of the Mountains, that Thomas had mentioned a desire to promote Love on at least one occasion according to a letter dated April 27, 1864. In closing, Hawley got it right. The Charlotte Western Democrat and Stringfield's diary entry were simply hearsay and should not supersede primary sources, in this case the official records which indicate the exact rank that each of the three Confederate officers, themselves, would write down on the surrender documents, also called surrender papers, on May 7, 1865. But it should not be considered as demoting nor downplaying the stellar army record of James Robert Love, because, according to rank and responsibilities, Love had commanded the infantry regiment for much of the Civil War, a command position that was assigned to the rank of Colonel. In the final chapter of the conflict, Richmond had been burned to the ground, Jefferson Davis and cabinet were on the run, Lee had surrendered to Grant, many Rebel generals were fleeing to Canada, South America, Europe, and some to Mexico, and with the Confederacy now just another lost cause, there just was not much attention given to promotions. Recommended Reading: Storm in the Mountains: Thomas' Confederate Legion of Cherokee Indians and Mountaineers (Thomas' Legion: The Sixty-ninth North Carolina Regiment). Description: Vernon H. Crow, Storm in the Mountains, dedicated an unprecedented 10 years of his life to this first yet detailed history of the Thomas Legion. But it must be said that this priceless addition has placed into our hands the rich story of an otherwise forgotten era of the Eastern Cherokee Indians and the mountain men of both East Tennessee and western North Carolina who would fill the ranks of the Thomas Legion during the four year Civil War. Crow sought out every available primary and secondary source by traveling to several states and visiting from ancestors of the Thomas Legion to special collections, libraries, universities, museums, including the Museum of the Cherokee, to various state archives and a host of other locales for any material on the unit in order to preserve and present the most accurate and thorough record of the legion. Crow, during his exhaustive fact-finding, was granted access to rare manuscripts, special collections, privately held diaries, and never before seen nor published photos and facts of this only legion from North Carolina. Crow remains absent from the text as he gives a readable account of each unit within the legion's organization, and he includes a full-length roster detailing each of the men who served in its ranks, including dates of service to some interesting lesser known facts. Continued below. North Carolina Troops, 1861-1865: A Roster (Volume XVI: Thomas's Legion) (Hardcover, 537 pages), North Carolina Office of Archives and History. Description: The volume begins with an authoritative 246-page history of Thomas's Legion. The history, including Civil War battles and campaigns, is followed by a complete roster and service records of the field officers, staff, and troops that served in the legion. A thorough index completes the volume. Continued below. Recommended Reading: The Civil War in the Carolinas (Hardcover). Description: Dan Morrill relates the experience of two quite different states bound together in the defense of the Confederacy, using letters, diaries, memoirs, and reports. He shows how the innovative operations of the Union army and navy along the coast and in the bays and rivers of the Carolinas affected the general course of the war as well as the daily lives of all Carolinians. He demonstrates the "total war" for North Carolina's vital coastal railroads and ports. In the latter part of the war, he describes how Sherman's operation cut out the heart of the last stronghold of the South. Continued below. Midwest Book Review: The Civil War in the Carolinas by civil war expert and historian Dan Morrill (History Department, University of North Carolina at Charlotte, and Director of the Charlotte-Mecklenburg Historical Society) is a dramatically presented and extensively researched survey and analysis of the impact the American Civil War had upon the states of North Carolina and South Carolina, and the people who called these states their home. A meticulous, scholarly, and thoroughly engaging examination of the details of history and the sweeping change that the war wrought for everyone, The Civil War In The Carolinas is a welcome and informative addition to American Civil War Studies reference collections.